Do you run giveaways using social media? Have you considered partnering with an influential blogger? Working with the right blogger for a giveaway drives sales and grows brand awareness for your products or services. 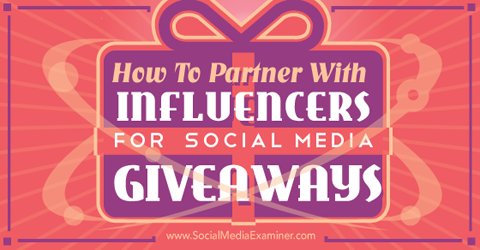 Discover how to partner with influencers for social media giveaways. There are plenty of ways to find bloggers to partner with. Here are three of the most common approaches. This is probably the best way to find the right blogger partner. Use the search features of popular social networks like Instagram, Twitter and Facebook to discover influencers in your industry. Search using specific hashtags that are relevant to your business. 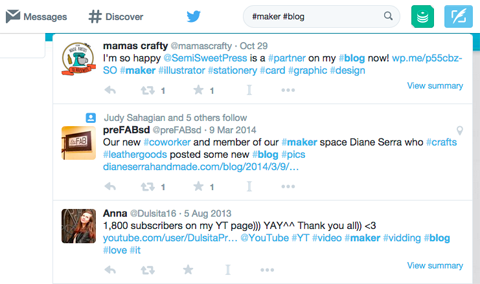 For example, if you have a 3D printing business and you want to attract makers who blog about their projects, search with the hashtags #maker and #blog. To research bloggers on social media, do a Twitter search that includes a relevant hashtag for your business, as well as the hashtag #blog. Also, check out what I call “influencer discovery tools.” These are websites such as BuzzSumo that give you access to influencers. Do a search for influencers on BuzzSumo using keywords like “marketing,” “fashion,” “fitness,” “food”–whichever is most relevant. Use BuzzSumo’s software to find relevant influencers and popular content based on keywords. Another way to research influencers is to survey your audience. Create a form and ask your customers or fans to recommend their favorite bloggers to you. Ask your audience to recommend bloggers they trust to you. Want something even simpler? Gather fan feedback via “question-style” posts on your company’s various social media channels. Another way to find good bloggers is to use a tool like GroupHigh. GroupHigh software allows you to quickly build lists of quality bloggers based on topics, content, location and more. You can also search and filter to find and prioritize your blogger outreach, based on which bloggers are active on popular social networks. 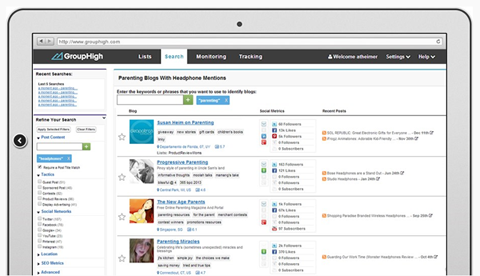 Use a software solution such as GroupHigh to search by keywords or phrases and discover influential bloggers in your industry or category. If your brand is interested in teaming up with a really established blogger who has significant influence and a massive following, contact a blogger talent agency. It’s a relatively new concept, but many of the most well-known and established bloggers are represented. One of the biggest is Digital Brand Architects (DBA), which essentially brokers the relationships between brands and the bloggers DBA represents. If you are considering a blogger talent agency, fill out the talent management inquiry form on the Digital Brand Architects website. 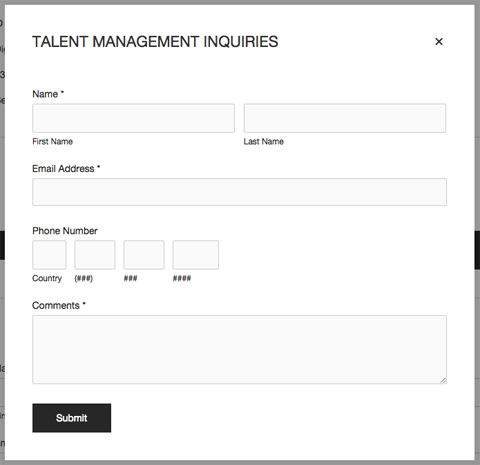 To access it, go to their Contact tab and click the For Talent Management Click Here button. A blogger talent agency should be able to connect your brand with their blogger talent based on your brand’s goals and vision. After you find some quality bloggers, take a closer look to choose those to pursue and pitch. Here are some things to look at to determine if a blogger is a fit. Look how often potential blogger partners post to their blog and on their social platforms. No matter whom you partner with on a giveaway, you want to make sure they are active on all of their social channels. Review the size of the bloggers’ social media presence on multiple networks. This research is good intel for when you devise a promotion strategy for your partnered giveaway. 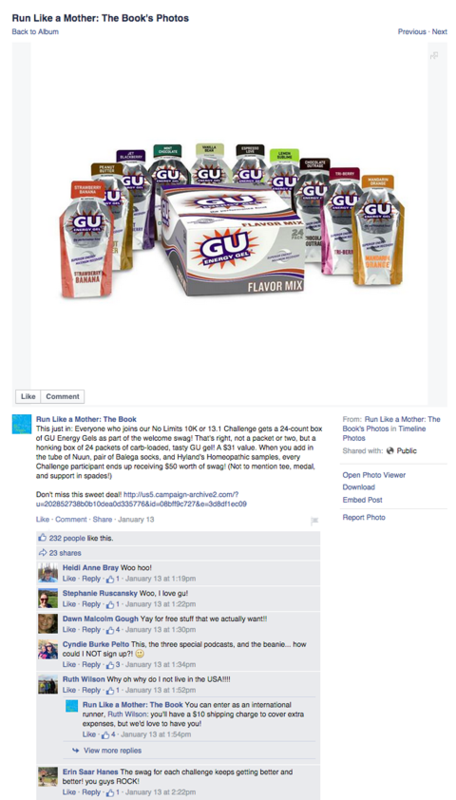 The Facebook page for the blog Another Mother Runner has 43,000 active fans, which is one of the reasons GU Energy Fuel wanted to partner on a giveaway. First, check to see if each blogger has worked with any of your competitors. Then look at the rest of the companies the blogger has worked with, and see if your brand fits with them. It is important to develop what feels like a natural partnership, since bloggers need to be able to talk about your brand and their partnership with you in a genuine, organic way. Once you find and vet bloggers, pitch your brand’s partnered giveaway idea. This is a critical step. If you are contacting the blogger directly (not going through an agency), here’s what to include in your first email. Add something unique in your pitch email that makes you stand out, so you are more likely to get a response. Call out and link to a post of theirs you really liked, tell them why you think the blog is awesome or recount a quick story that somehow relates to the blog. Taking this step proves to your blogger that you’ve already invested your time into getting to know who they are and what they’re about. Plus, it will not sound like a generic email you’ve sent out to hundreds of other bloggers. Also, tell the blogger specifically why you’re pitching your giveaway idea to them. Is it because they have a readership that would appreciate what you’re giving away? Is it because they’ve mentioned your brand before in one of their posts and got a good response from their readers? Explain the value of partnering with your company on a giveaway to paint a clear picture of your idea. Included a deadline in your pitch. Image: Shutterstock. 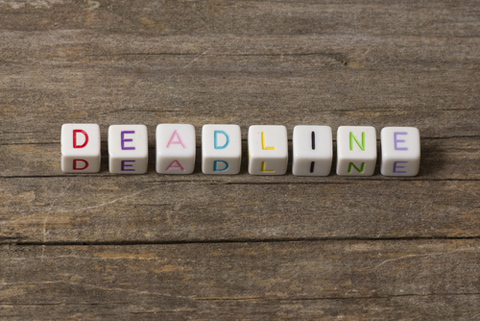 The last thing is to include some sort of deadline. This could be a date by which you need to hear back or the date of an important event, such as a product launch. This gives the blogger insight into your brand’s goals and how quickly you want to move. Add as much relevant information as you deem necessary to help the blogger decide if he or she wants to partner on your company’s giveaway. After you find a blogger who is a good fit for your company giveaway, create a contract for your partnership. 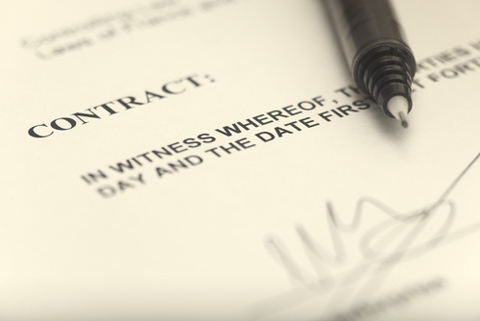 Do this as soon as possible, since agreeing on the language and details of a contract is often the longest part of the process. Blogger Sarah Bowen Shea, COO of Another Mother Runner, and her co-founder have partnered with a number of well-known athletic brands on all sorts of giveaways. According to Shea, it takes an average of about three months from pitch to signing the contract. This is typical. Everything always takes longer than expected, so plan ahead. One clarification before we move on. It’s often the party who pitches the partnership or sponsorship opportunity that creates the contract. (Most people might assume it’s the brand, but that’s not always the case.) Established bloggers are brands in their own right and so most of them know the drill when it comes to creating and signing contracts. Get a contract in writing. Image: Shutterstock. If your company is drafting the contract for your giveaway, there are three main components to include. It’s important to clearly state your brand’s goals for partnering with the blogger on the giveaway. This helps the blogger understand his or her role in your partnership. The publish date and expectations of the blog post announcing your co-branded giveaway. Does the blog post need to use specific branded images? Is there specific brand information you want the blogger to share? Make sure you cover all of the details of the giveaway announcement, including the rules set in place by the FTC. The number of social media posts promoting the giveaway you expect from the blogger. Be sure to include specific verbiage, creative and maybe even hashtags used in social media posts. Logo usage details. Both brands and bloggers should be specific about where and how their logos appear during a partnership’s contract period. Post-giveaway expectations. After the giveaway is over, it’s fair to expect a detailed report that’s complete with social media numbers, comments from the blog post, number of giveaway entries collected–everything. Experienced professional bloggers should agree to deliver these metrics by a certain date following the giveaway. The amount of money a company can expect to pay a blogger for a co-branded effort, if anything, will vary widely, depending on the blogger’s reach and the amount of effort the blogger is required to invest. Some bloggers may charge an hourly, others may charge a flat rate and some may work on trade. Bloggers may ask for a portion of the fee up front and the remainder at the end of your co-branded efforts. Compensation will vary greatly. Image: Shutterstock. Whatever agreement you come to, make sure you have it in writing. Once you find, pitch and negotiate with bloggers, the next step is to create and implement your social media contest. Of all the ways brands and bloggers can work together, a partnered giveaway is one of the most productive efforts. Giveaways are the perfect opportunity for companies to collect valuable data such as email addresses that they can use for future marketing efforts. Plus, they’re a great way to encourage influencers to engage and share a specific message on behalf of your brand. They can certainly benefit everyone involved. What do you think? Have you partnered with a blogger on a giveaway? How has it worked out? What advice do you have for others considering a blogger partnership? Please share your thoughts, recommendations and questions in the comments. Can Buying Installs Aid Organic App Ranking?